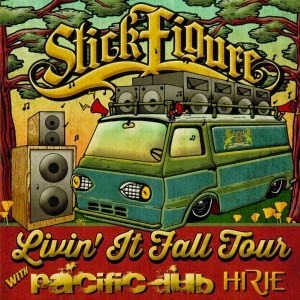 Stick Figure, a California roots / dub reggae band, will bring their Livin' It Fall Tour to the Visulite Theatre in Charlotte, NC this weekend. The nationwide fall tour also includes the supporting bands Pacific Dub and Hirie. The show will be this Sunday September 21, 2014 with doors opening at 7:00 PM show starting at 8:00 PM. Stick Figure is the creative talents of multi-instrumentalist and producer Scott Woodruff. Scott began his career recording solo, layering various instrumental tracks in the studio to produce some great reggae albums. After the success of the 2012 "Burial Ground" release, which hit #1 on the Billboard and iTunes charts, Woodruff decided to take his music on the road. This brings us to the current four piece group of himself, Kevin Bong (Keyboards), Kevin Offitzer (Drums) and Tommy Suliman (Bass). Stick Figure's upbeat roots reggae / dub sound will definitely leave you craving more. I highly recommend anyone that loves great music to come out to the Visulite Theatre this Sunday night to experience what the California roots sound is all about. It will not disappoint!